Is there a minimum length that I would have to buy? If I needed 107ft would you sell just that amount, or would I have to buy 150ft? You can buy 107ft. For some of the wire ropes offered, there is a minimum order amount, usually around 25ft for a cable of this size. Over that, you can order any specific length you want. What is the safe working load? 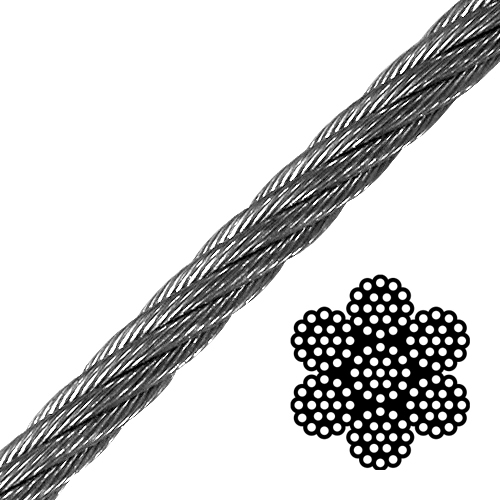 Wire rope like this is not assigned a Working Load Limit (WLL), but rather a published Breaking Strength. The end user is responsible for determining use and applying an appropriate safety factor, generally 5:1 or higher. As an example, if you apply a 5:1 safety factor, that would mean a 7,400 lbs WLL. Your application may or may not require a different safety factor.